No suprises here, Sublime and Family Guy top their respective charts, half the school is apparently not interested (or at least not affiliated) in politics, maybe that has something to do with the fact that a 1/3 of the campus is single and on the prowl? Northeastern has some similarities with Umass, a lot actually. 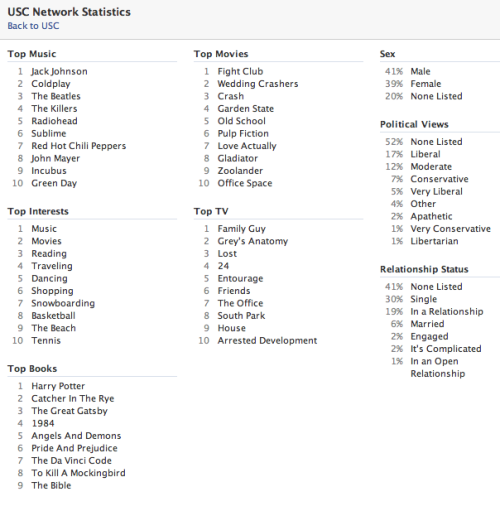 1/3 of the campus is single and 1/2 are not affiliated with a political view, the top TV show is Family Guy and the top book, like Umass is Harry Potter. Hey, here’s something interesting, UNC has only 1% less students who call themselves “liberal” (18%) than Northeastern and Umass (both at 19%)! Harry Potter once again tops the books list, but the Bible (something not on either of the other two networks) comes in at #2! 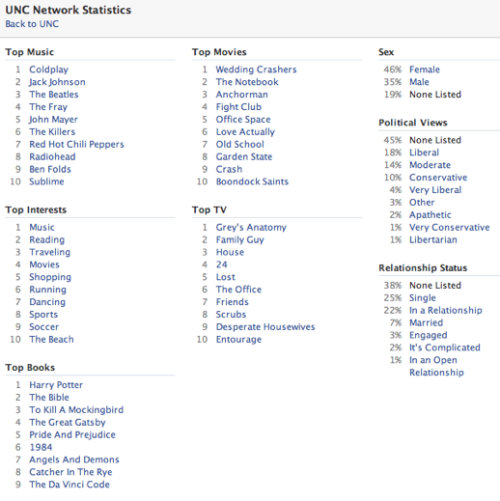 facebook also backs up the popular claim that there are more girls than boys at the campus (46% female to 35% male). In general, all three campuses have pretty much the same interests even though they have slightly different demographics. 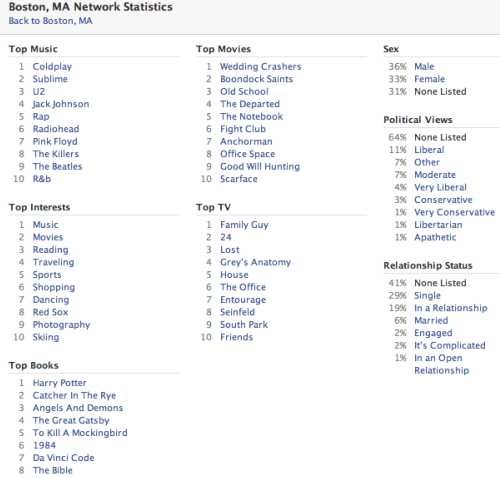 There’s some grumblings on the Northeastern network page about the “masculinity” of their campus due to Jack Johnson being the #1 musical artist but at least they don’t have Coldplay topping their charts like UNC! Sorry Coldplay fans, no me gusta…and of course Ben Folds joins the top ten list (they are from Chapel Hill), and the Fray make it into UNC’s top ten list. From my personal experience at USC, the campus was a great source of new music and movies as many of the students had connections within the music industry either through friends in bands, or internship experience and of course the USC Film School is one of the best such programs in the country so I was expecting for USC’s musical and cinematic preferences to be different from other schools, yet the facebook network stats doesn’t back up this hypothesis. There are some slight differences, for instance USC has Gladiator and Zoolander in it’s top ten movies and John Mayer in it’s top ten music list, but other than those two slight differences, USC students like the same things UNC, Umass, and Northeastern students like. Not a very groundbreaking statement there, considering how students from everywhere attend schools everywhere and we’re all so connected it’s tough not to watch the same movies and listen to the same songs. Aaargh, Coldplay at #1 again. 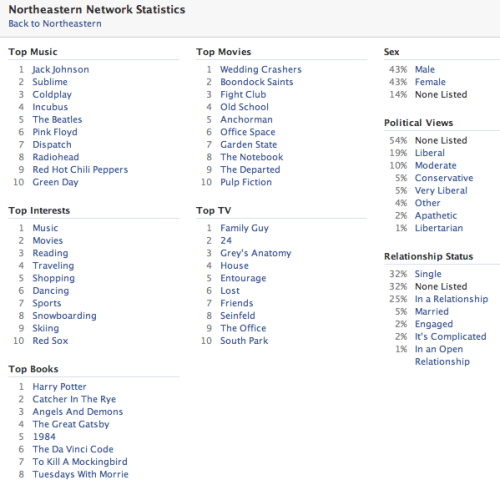 Other than Rap and R&ampB making their way into the top ten list, there’s not much of a difference between the Boston network page and the four colleges we’ve looked at. Looking at a few of the other cities across the country generally leads to the same results. There are differences in musical tastes between say Cincinatti, Ohio and Boston, Massachusetts but not a huge difference. What does this conformity say about our society? Are we all really that similar? 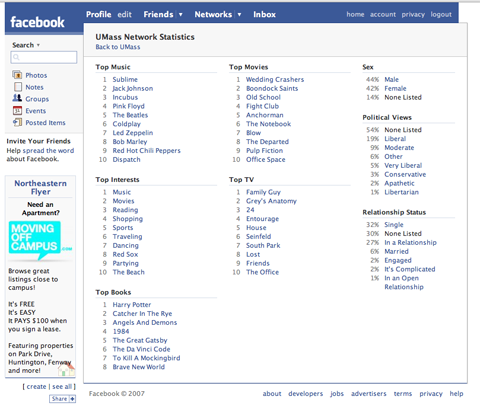 Its just whats popular in a small group like one of the campuses is also popular nationwide. If the lists were expanded to 100 entries I’m sure you wouldve seen more differences. Interesting read tho. Thanks for the visit Ted. You are right that we’d see a greater variety with a larger list. I used to think of FaceBook as a ‘kiddie’ site. Your blog changed my mind. Thanks!! I’ll definitely check back!! This is a neat feature of Facebook. A cool app would be to aggregate the various network data, perhaps see how it changes over time, etc. William, be careful not to give too much credit to facebook either. After all, it did derive from a college audience so there’s plenty of immaturity to be found too. Shanti, that sounds like a great idea, sort of like google/digg trends. I imagine the facebook people already have a very similar trending application in-house that they utilize to generate and present audience statistics to potential advertisers and investors.